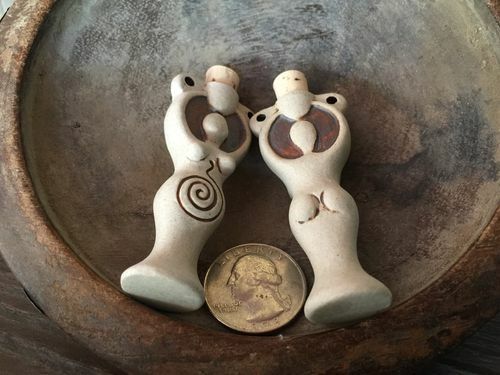 Wonderfully crafted curvaceous raised arm, spiral goddess vessel pendant in unglazed porcelain ceramic. While this small container is not mean for food or drink, feel free to add special powders, tiny crystals or a sampling of sand from your favorite beach. The pendant is glazed on the inside so it can hold liquid as well—perhaps an essential oil? Each pendant has two holes (one on each side of the cork) for stringing with leather or other cord. Not including the cork, the vessel is 2-1/3 inches high by 1 inch wide at the widest point. (54mm tall with the cork, 2-3/4mm without the cork and 25mm wide). 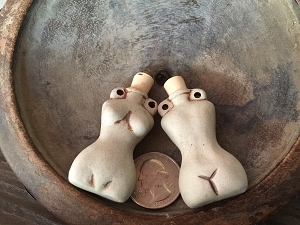 The pendants are two-sided and have brown accenting. 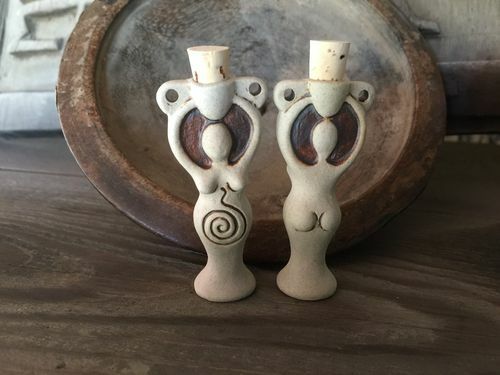 They also stand on their own so they can also be added to an altar or shrine. These are sold individually. The front and back are pictured so that the detail can be shown.